VO2 max, an estimate of how efficient your body is using oxygen, which gives you a measure of your cardiovascular health. The Vivosmart 3 also uses this information to measure your fitness level, which compares your VO2 max score to your age to rate your fitness from "poor" to "superior." It's a good, at-a-glance way to see how you're doing. Stress level, which monitors your heart rate when you aren't exercising to see when it rises and falls. It uses that data to gauge how stressed you are, and walks you through breathing exercises right on your wrist. Strength training tracking, which tracks reps, sets, and rests in between sets. This lets you keep closer tabs on your workout, giving you a better look at the exercises you're doing — which makes it easier to see how you're improving over time. Activity intensity, which automatically measures how hard you're working out. Garmin compares that to activity recommendations made by leading health organizations to judge whether you should push your workout farther. And, as you would expect from any fitness tracker, all of this data is synced with the Garmin Connect app so you can stay on top of your health. To help you reach your goals, Connect offers tips from health experts and personalized insights. Though it won't replace a personal trainer, The Vivosmart 3 is smarter than your average fitness tracker. The featureset is similar to Fitbit's new Alta HR, but depending on what you want from a fitness tracker, you may prefer the Vivosmart 3. The Alta HR's slim profile and multiple band options make it a win for fashion, but the Vivosmart 3 includes more fitness tracking — and while its simple black or purple body won't make any fashion statements, it won't clash with what you're wearing, either. Alta HR also can't measure VO2 max or stress level, and it won't survive a swim or track strength training reps. However, the Alta HR's reduced featureset does give it two more days of battery life (seven days to the Vivosmart 3's five days). Those who prioritize style may still prefer the Alta HR, but the new Vivosmart 3 has a lot of great fitness features going for it. 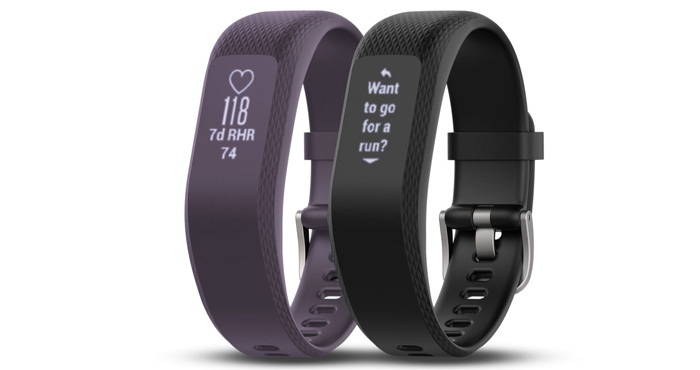 Perhaps most importantly, the Vivosmart 3's price is right. While the Alta HR is already well-priced ($149.95 on Amazon) for a fitness tracker of its class, the Vivosmart 3 costs even less. You can order a Vivosmart 3, shipping today, for just $139.99 on Garmin — $10 less than the Alta HR.